Scientists have made a significant discovery explaining how and why the billions of different cells in our bodies look and act so differently despite containing identical genes. Their discovery, made by a team from Smurfit Institute of Genetics at Trinity College Dublin, Ireland, applies to all complex animals, including humans. The team discovered a completely new family of proteins in animals with vertebrae (backbone) — fish, reptiles, birds and mammals — naming them Pali1 and Pali2. These proteins originated millions of years ago from genes that adapted from invertebrate to vertebrate animals while gaining new functions. Specifically, they found that Pali1 is vital to embryo development - controlling cellular identity. Associate Professor in Genetics at Trinity, Adrian Bracken, led the team, who just published their findings in Molecular Cell. Dr Eric Conway and Dr Emilia Jerman, lead authors on the paper, previously worked as PhD students in the laboratory of Professor Bracken. The Bracken team also collaborated with the Haruhiko Koseki lab at the Riken Institute in Japan. This new research helps us understand why a blood cell and a brain cell look and act very differently, yet contain exactly the same genes. The puzzling question of so-called 'cellular identity' is central to epigenetics, which strives to "un-puzzle" why sets of genes act differently. Epigenetic influences affect how key molecular structures in every cell type respond in unique histone patterns which either tighten or loosen chromatin surrounding gene groups - allowing genes to be functioning "on" or not functioning "off". Central to epigenetic regulators are Polycombs, which regulate cell identity in multicellular organisms of both plant and animal kingdoms. The Bracken lab studies Polycomb epigenetic regulators and newly discovered Pali1 and Pali2 proteins. These form a new family of Polycombs unique for only being found in vertebrates. Professor Bracken: "Discovery of Pali1 and Pali2 is an important step forward in our understanding of how stem cells specialise in complex animals, such as fish, reptiles, birds and mammals. "In addition to its relevance to stem cell biology and regenerative medicine, our discovery may also have implications for future cancer therapies. For example, we are also studying a related Polycomb protein called EZH2, whose function is deregulated in certain blood and brain cancers. Several new drugs have been developed to target EZH2 to treat these patients, but our new results suggest these patients could also potentially be treated by drugs targeting the Pali1 and Pali2 Polycomb proteins, which might provide additional benefit." The polycomb repressive complex 2 (PRC2) consists of core subunits SUZ12, EED, RBBP4/7, and EZH1/2 and is responsible for mono-, di-, and tri-methylation of lysine 27 on histone H3. Whereas two distinct forms exist, PRC2.1 (containing one polycomb-like protein) and PRC2.2 (containing AEBP2 and JARID2), little is known about their differential functions. Here, we report the discovery of a family of vertebrate-specific PRC2.1 proteins, “PRC2 associated LCOR isoform 1” (Pali1) and Pali2, encoded by the LCOR and LCORL gene loci, respectively. Pali1 promotes PRC2 methyltransferase activity in vitro and in vivo and is essential for mouse development. 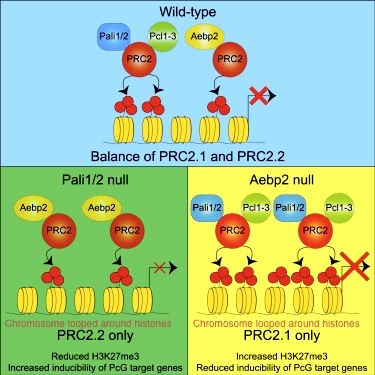 Pali1 and Aebp2 define mutually exclusive, antagonistic PRC2 subtypes that exhibit divergent H3K27-tri-methylation activities. The balance of these PRC2.1/PRC2.2 activities is required for the appropriate regulation of polycomb target genes during differentiation. Pali1/2 potentially link polycombs with transcriptional co-repressors in the regulation of cellular identity during development and in cancer. The ongoing research in the Bracken lab is supported by funding from the Irish Cancer Society, the Irish Research Council, Worldwide Cancer Research, the Health Research Board and Science Foundation Ireland. Pali1/2 potentially link polycombs with transcription co-repressors in regulating cell identity during development and in cancer. Image credit: Braken Laboratory, Trinity College Dublin, Ireland.